If your son is on the path to becoming an Eagle Scout, he will be joining a century-old tradition of excellence in the scouting community. Becoming an Eagle Scout is not easy, nor is it common - only 4% of scouts attain the ultimate level of scouting. Once a scout achieves this goal, he will be in good company among those who are Eagle Scouts. Some of the most well-known eagle scouts include film producer and director Steven Spielberg, astronaut Neil Armstrong, President Gerald Ford, Secretary of State Rex Tillerson, and Supreme Court Justice Stephen Breyer. Eagle scouts have given a tremendous amount of time volunteering in the United States, with a cumulative total of over one hundred million hours since Eagle Scouts became a division of the Boy Scouts of America. Having already fulfilled the requirements to earn 21 badges in order to qualify as an applicant to the Eagle Scout level, boys know that becoming an Eagle Scout will require much time and dedication to maintain their elite status. 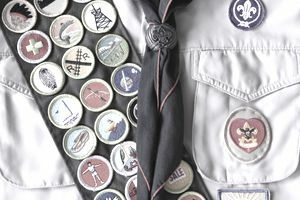 Recommendations that affirm a scout's character are an integral part of the application process. Eagle Scouts are expected to live up to the values and morals espoused in the Boy Scout oath and law. When an Eagle Scout applicant provides strong letters of recommendation, it supports their candidacy to become an Eagle Scout to the Eagle board of review. All prospective Eagle Scouts must supply five character references as part of their applications. Asking for a letter of recommendation can be a daunting task, but it's important that the scout make the request, not the parents. Feeling confident enough to request support from someone he looks up to is an important trait for any scout, but especially an Eagle Scout. Requests should be made in person if possible, and thank you notes should be promptly written after receipt of the recommendation. A religious leader or spiritual advisor: If your son does not attend a church or temple, he can write an essay about his mortal beliefs instead. A teacher: preferably one who has worked closely with your son and can attest to his work ethic and values. An employer, if possible. Since the Eagle board of review must happen within 6 months of his 18th birthday, some applicants might not be employed. If this is the case, consider a reference who has worked with your son for extracurricular activities. Two reference character letters, for a total of five recommendation letters. Once the references have agreed to supply the letters of recommendation, the letters are mailed directly to the troop. Your son should supply stamped envelopes addressed to his troop's unit chairman or whichever adult has been designated to receive them. You, his parents, will also write a letter of recommendation. In your letter of recommendation, you can speak to your son's character, explain what scouting has meant to him, add any insights about why he chose his particular Eagle project, and supply supporting examples for your reference letter points. As a final step, your son should double check the status of the letters with his troop leaders to make sure all of the required references have been received. On occasion, it might be necessary to remind the individuals who committed to writing the letters of recommendation of any approaching deadlines. It is ultimately the responsibility of the applicant to ensure that the letters of recommendation have been delivered to the Eagle board of review in a timely manner.